For my project I was finally able to finish a project I have really been wanting to make! 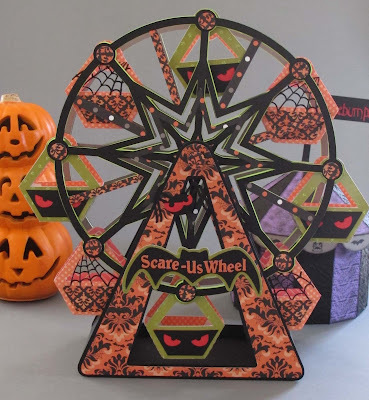 It's from the amazing SVGCuts Summer Carnival kit, the kit that totally hooked me on their files, yet I hadn't had time to make one... But I finally did! This kit is very well thought out, and takes A LOT of paper! The only thing hard about it is picking out the papers though. It was really fun to make. 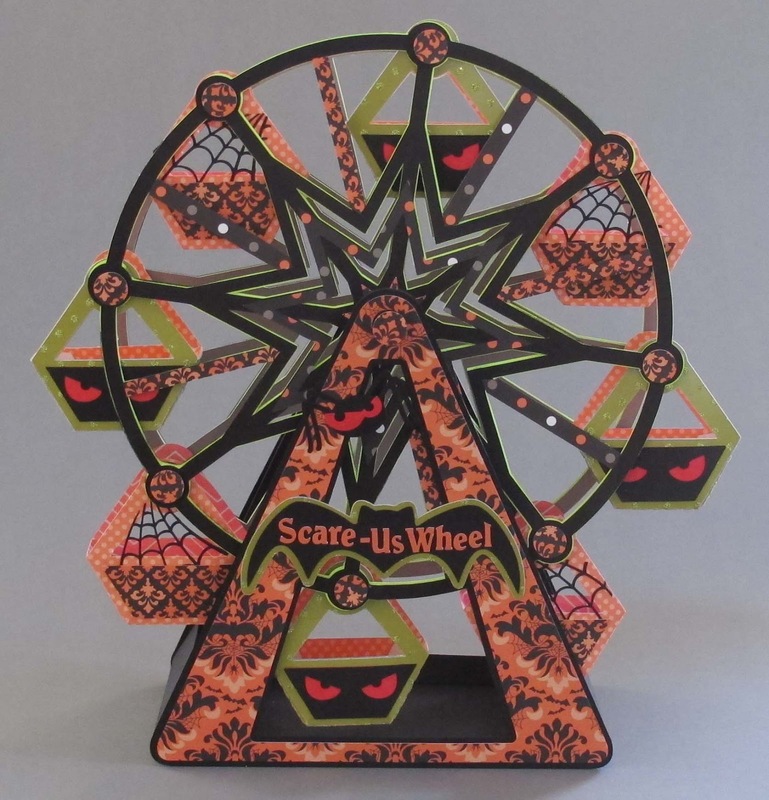 The spider webs are from SVGCuts Salazar's Scary Squares and the spooky eyes, bat and spider are from the Party on Elm Street kit. 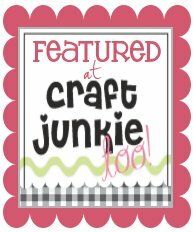 Most of the papers are from the Close to my Heart Spellbound kit with a few sprinkled in from my stash. At our house Halloween has always been a big holiday to decorate for. I also love miniature houses and scenes. (Christmas town is out of control, seriously). 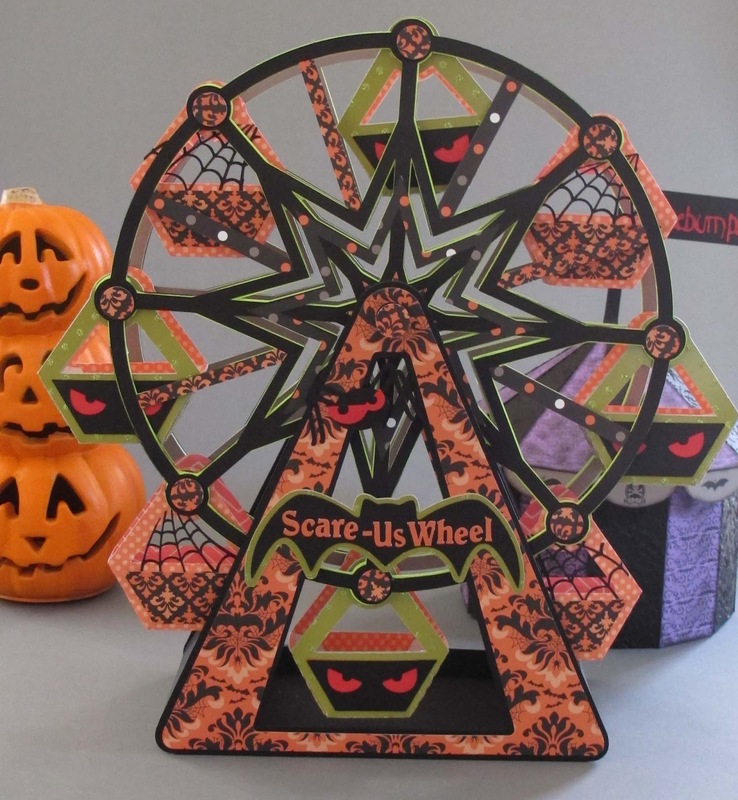 I also decided to make the tent to go with the Scare-us Wheel, we wouldn't want it to feel lonely! 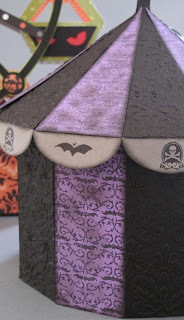 I embossed the black pieces with a damask embossing folder and then used a fun bat damask stamp for the purple panels. One of the funnest parts? 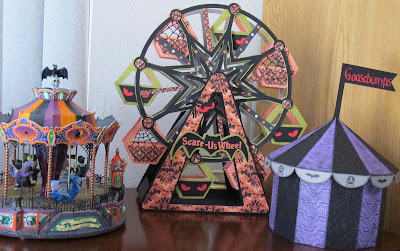 These pieces both fit in perfectly with my little Spooky Town that I have been collecting for years. I already had the Scary go Round in my kit! I can't believe how perfect they all are together! 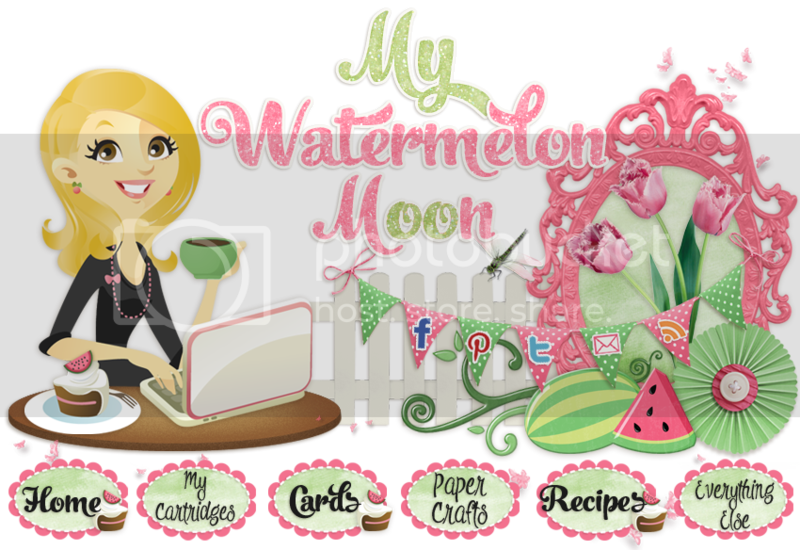 UPDATE: This was originally a design team post for My Crafting Channel, Nana at My Crafting Channel has disappeared! I Can't even begin to tell you how sad that makes me :( I have tried to contact her, but she is hiding in cyber space. I hope all is okay with her. WOW! !Melissa,This is AMAZING!! 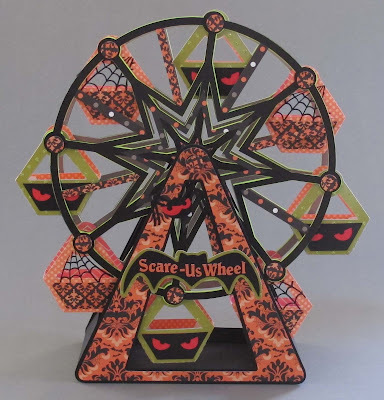 !Love the Scare-us Wheel! 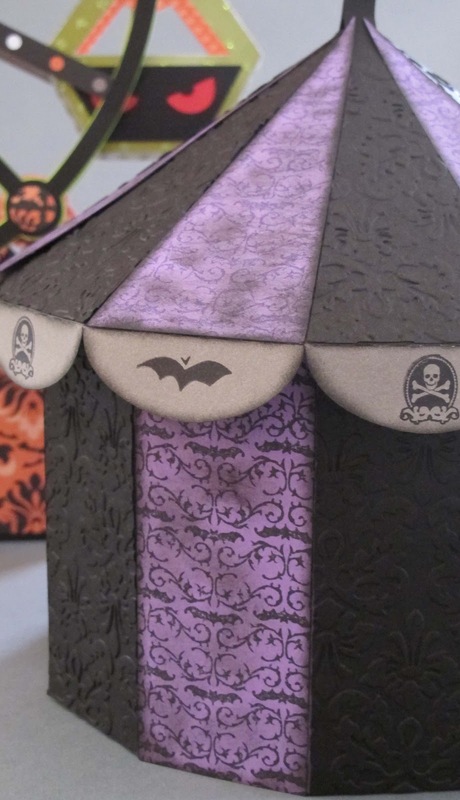 !Super Duper Cute tent!!WOW! !Love everything about it!! Awesome Melissa. I love it. Love the papers used. You ROCKED this project. Wow, impressive indeed! 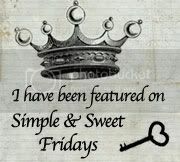 New follower from the blog hop, would love a follow back. Wow! How perfect for fall! You did a great job Melissa! I am impressed with that work! Leuk dat je meedoet met Creative Cutting Challenge.